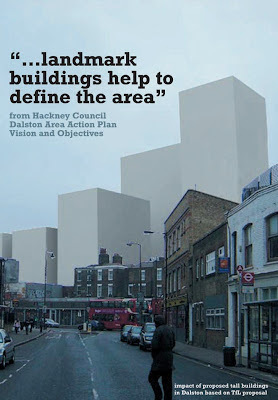 When Hackney decided upon its blueprint for future development in Dalston (the "Dalston Area Action Plan") little consideration was given to the environmental impact on public space which building various 10 to 20 storey towers around the area could have. 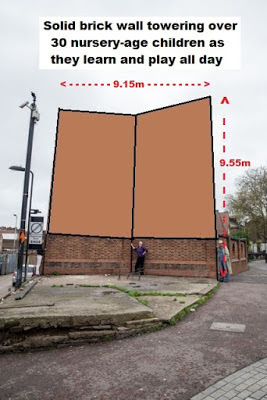 This, we were told, would be carefully scrutinised when the planning applications were decided. 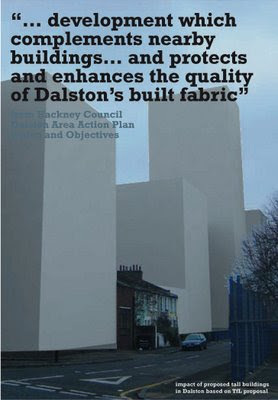 But when the planning applications came to be made, and people objected to the canyon effects, the loss of sunlight and increased wind speeds, the developers complained that the Dalston Area Action plan "entitled" them to build and the planners, fearing appeals, granted them permission. 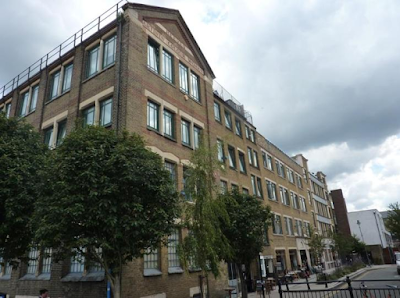 The TfL/Taylor Wimpey development on the east side of the Kingsland High Street, where once there were two storey buildings, now has 6 storeys. There are now afternoon and evening sunlight losses to Ashwin Street for much of the year, with the lower storeys of Reeves Artists' Colour Works reduced to below the standard for natural light. Sadly the view from the High Street of it, and of Shiloh Church, have also been obscured. 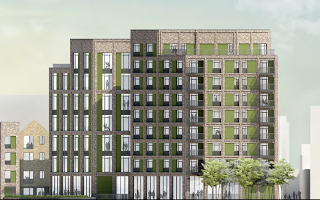 Only 8% of the flats are for social rent and all available green space is enclosed within a gated community. 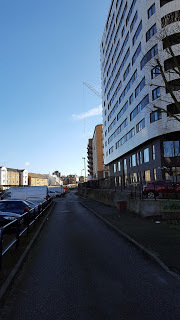 The development on the west, Boleyn Road, side exceeds the Area Action Plan policy on height and has blocked sunlight to the Grade II and locally listed High Street terrace so it, and even some of the new flats, are reduced to below minimum standards for natural light. The 57East tower, which is now being marketed for overseas investors, will act like a lighthouse in reverse, stealing sunlight from public space and local homes, as well a generating unpleasant and sometimes hazardous wind speeds. 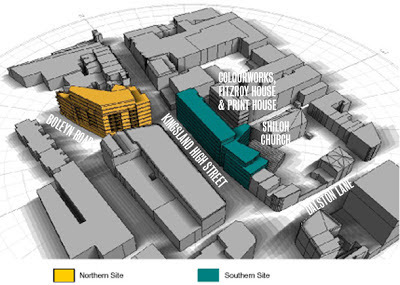 What does it give back to Dalston - only 15% "affordable starter homes" and no lifts for the station. Not even the needs of local children, for sunlight and quality outdoor space, were given adequate consideration when a block of private flats planned to overshadow Colvestone Nursery school playground was given planning permission. This was eventually overturned by the Planning Court despite Hackney's protestations. OPEN raised objections to the environmental blight which these overdeveloped schemes were predicted to cause. And now there is another scheme which will cast the remainder of the Eastern Curve further into almost permanent shade, including the part occupied by its neighbour, the Eastern Curve Garden. 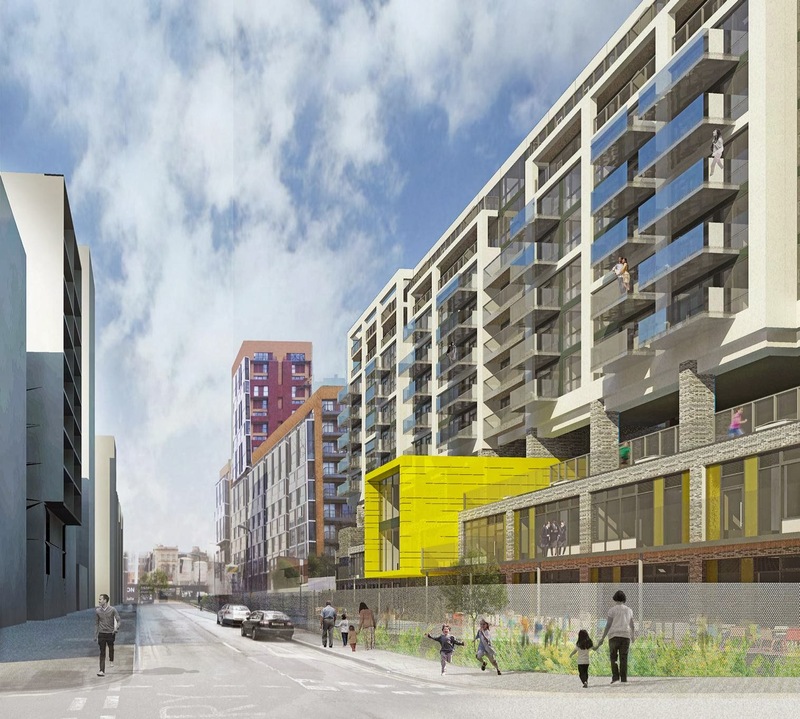 As if the eastern Curve Garden's troubles weren't already enough, this 10 storey Thames House scheme, on Dalston Lane north side, will rise like a cliff right along the Garden's eastern and southern boundary. It has been designed with little regard to the scale, use and needs of that public open space, whether used either as a Garden or as part of the proposed Eastern Curve pedestrian route. 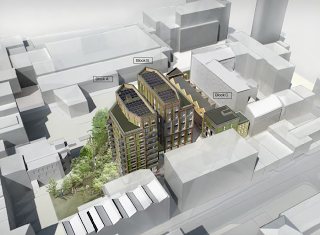 The developer will claim permission should be granted because its calculations show the Garden will still exceed the minimum sunlight guideline, which is a yearly average of 2 hours direct sunlight over 50% of its area. Even some of the new flats will be below standards for natural light. 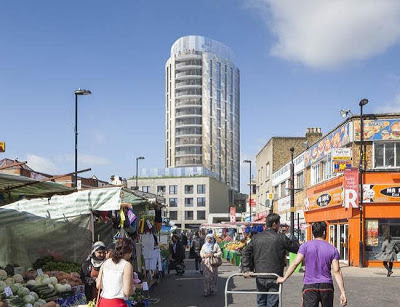 We will shortly publish more information about the Thames House development and how, as part of the public consultation, you can tell Hackney what you think.